Combine the Crust ingredients in a medium bowl. Press into the bottom and up the sides of a 9” springform pan. Bake 10 minutes; remove from the oven and cool on a wire rack. Place the chopped Chocolate and Water in a 1 qt. glass bowl and Microwave for 1 minutes; remove from the Microwave and stir until the Chocolate is completely melted. Set aside. Beat in the Salt and Sugar until the mixture is creamy. Beat in the Eggs, one at a time until just blended. Add the melted White Chocolate to the Cream Cheese Batter and stir until completely mixed in. Stir the Vanilla into the remaining Batter. Place the springform pan onto a baking sheet. Pour the Batter onto the baked Cookie Crumbs. Bake the Cake on the baking sheet at 325 degrees for 45-55 minutes or until the edges are puffed and the top is dry to the touch. Center should move slightly when pan is tapped but should not ripple as if liquid. 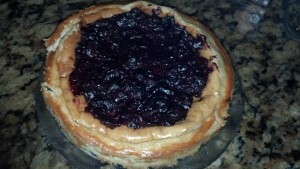 Cool completely on a wire rack; remove from the pan and top with the Blueberry Compote. *To crush the cookie crumbs, use your food processor with the metal chopping blade or place in a 1 Qt. Plastic Ziploc® bag and crush with your rolling pin. Rinse the Blueberries and drain. Melt the Butter in a medium size saucepan; add the Brown Sugar; when the Sugar melts, add the Lemon Juice and Blueberries. Cook just until the Berries start to release their juice; stir the Cornstarch with the Cold Water and stir into the Berries. When the Cheesecake has cooled and been plated spread the Berries on top; chill for about one hour. To serve, bring the Cake to room temperature. Cut small slices as this cake is very rich.